Videoforce Mobile LED-trailer is equipped with LED screen of best quality and ready for operation in all kind of weather conditions. Snow, rain , direct sun is not a problem. The screen has an extreme high calibrated brightness of 13500 nits. The perfect outdoor advertising medium. 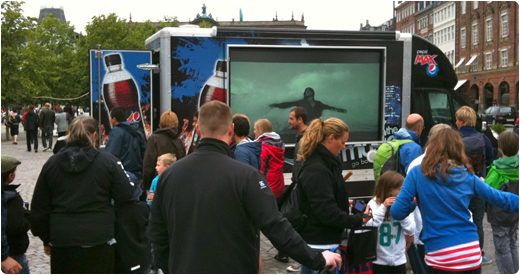 Designed for close proximity interaction, the High Definition screen and audio system coupled with the Digital AdVans interactive capabilities allow outdoor audiences to engage with your brands or services on a new level. The mobile nature of the Digital AdVan allows for precise demographic targeting via strategic placement of the vehicle, maximising exposure and optimising impact.